Last time I discussed the most basic casting set-up that I could think of, that was likely to create successful results. I also mentioned the biggest problem with this system – your model is destroyed in the process. So what sort of options do we have? Well, the first thing that comes to mind is to solve the problem of destroying your model yourself. You can make a mold of the model so that you have the option of making copies of the model if you want to make more items, or if the casting process fails. There are a lot of very user-friendly Room Temperature Vulcanizing compounds out there that do not require any special equipment. 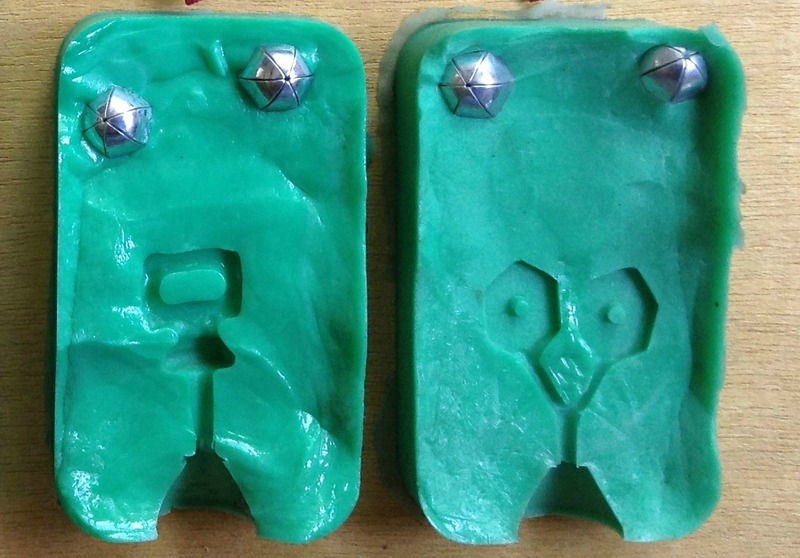 I have more complex equipment, but I still often use RTV compounds to make molds. Here are a couple of my molds. What if you really enjoy the idea of making the model, but you really are just not up to doing the casting yourself? Well there are reputable companies in the US that will take your model and cast it for you. They will generally want to make a mold of the model as insurance against a failed casting. You can arrange to receive the mold yourself, along with the cast piece, or have them archive the mold. Be sure to understand all of the costs, who owns the mold, and whether they archive it, or you get it back. I do not recommend sending a model “offshore” to places like Pakistan or China. Factories in these areas usually specialize in large quantity production. They often own the molds, and you may not get your master back. Your legal recourse if you are not pleased with the results, is limited, and you will have to pay import fees. I do know people who have their business production done off-shore. The Pakistani company is casting bronze pieces and their minimum order is 1000 of the same pieces. I was not impressed with their quality. The Balinese company is casting silver. They will cast much smaller numbers of items, but still not ones and twos, and their quality is very good. But back to getting work done in the US. As long as you understand the fees and rules you should be fine. Taking this to the extreme, there are shops that will do custom casting, from design to finish. The most technologically savvy shops will have computer design capabilities that will use 3D printers to create the original model. I have seen them in action, and it is amazing. Small shops may also be willing to do wax models and cast very limited quantities. I hope that this blog gives you some ideas about your casting options. This entry was posted in Metal Casting and tagged castin bronze, casting metal, casting silver, Metal casting by Eirny. Bookmark the permalink.